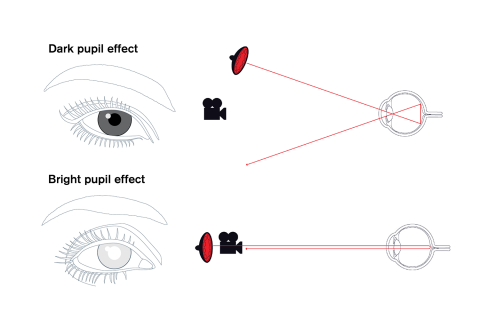 There are two different illumination setups that can be used with Pupil Center Corneal Reflection eye tracking: bright pupil eye tracking, where an illuminator is placed close to the optical axis of the imaging device causing the pupil to appear lit up (this is the same phenomenon that causes red eyes in photos), and dark pupil eye tracking, where an illuminator is placed away from the optical axis causing the pupil to appear darker than the iris. Different factors can affect the pupil detection during remote eye tracking when using each of these two techniques. For example, when using the bright pupil method factors that affect the size of the pupil, such as age and environmental light, may have an impact on trackability of the eye. Ethnicity is also another factor that affects the bright/dark pupil response: the bright pupil method works very well for Hispanics and Caucasians. However, the method has proven to be less suitable when eye tracking Asians for whom the dark pupil method provides better trackability. Most Tobii eye trackers use both bright and dark pupil methods to calculate the gaze position. The exceptions are the 50‐Series, TX300 and both Tobii Glasses series eye trackers that use only dark pupil tracking. Eye trackers that use both dark and bright pupil tracking during calibration initially subject all participants to both methods and the method that is found to provide the highest accuracy is chosen for the actual recording. During a recording these eye trackers may switch between bright and dark pupil tracking when conditions change in a way that have a significantly negative impact on trackability. If that happens, Tobii eye trackers will switch between the two methods until valid data is obtained once more.